It is the purpose of the author of this book to write a history devoted almost exclusively to Clarke County and its people. No such history has ever been published. “Ball’s History of Clarke County and Surroundings” contains much general history, necessitating much reading before reaching the pith of the story. However, there is much in Ball’s History relating to early days of Clarke and its citizens. Pickett’s History. Pickett is a fluent writer and perhaps accurate in his details. 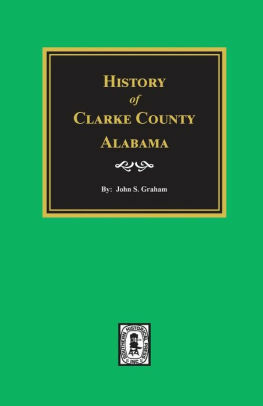 The author of this book has been a citizen of Clarke County since 1875, and since that time much has transpired in the county under his personal observation. We have watched with pride and satisfaction the progress made in the county for the past forty-eight years. This book will doubtless be read with much interest by the present generation living in Clarke, as well as by the generations to follow. If it should be preserved and handed down through the coming years, it may, in the far distant future, iali under the eye of some descendent of some Clarke countian and enable him or her to look to back through the avenue of time and get a mental picture of Clarke County in the nineteenth and twentieth centuries.